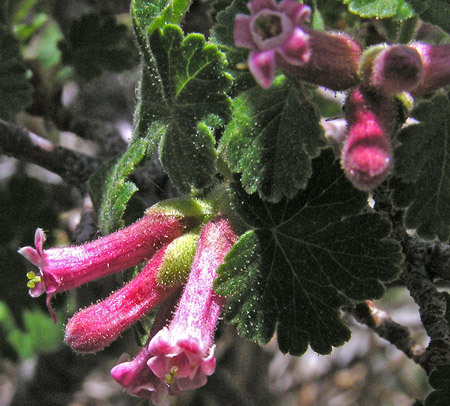 A number of species of Ribes abound in the San Juans, Abajos, La Sals, and Chuskas. 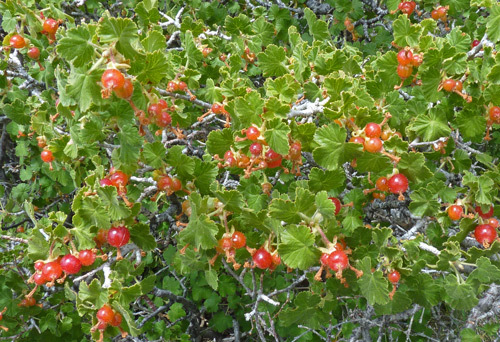 Many Ribes produce a nice crop of small but sweet berries ranging in color from orange to red to black. 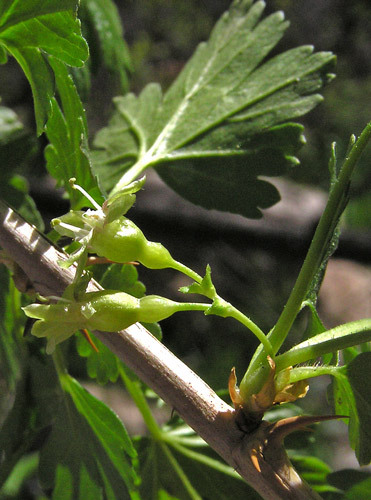 The genus Ribes includes what are commonly called Gooseberries and Currants. 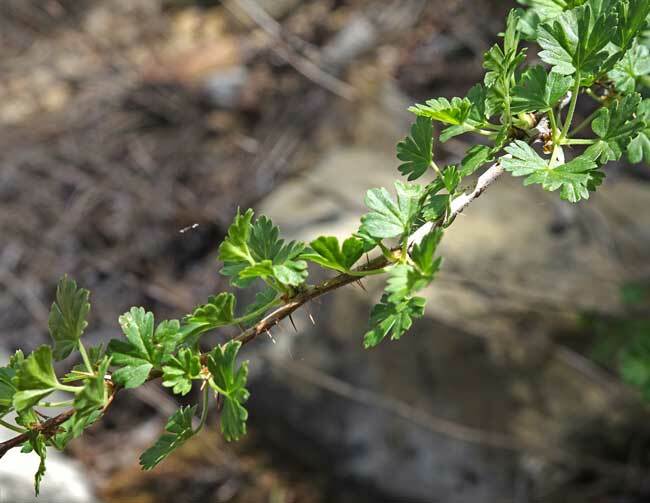 Although some folks say that Gooseberries have thorns and Currants do not, this is not agreed on by other folks and, in fact, a species may have thorns at one point in its life-cycle but no thorns at another time or it may have minute thorns on some stems and no thorns on other stems. 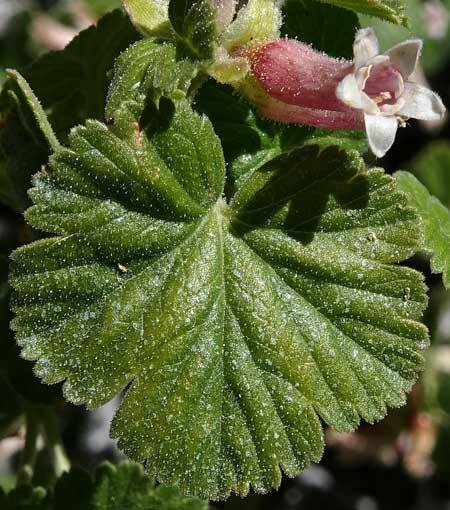 This web site calls all members of the Ribes genus, "Currants". 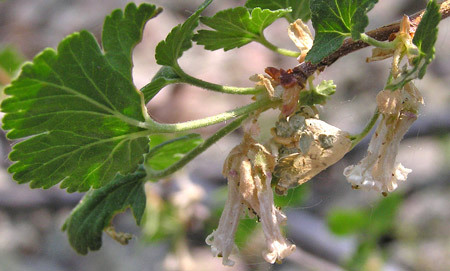 The name "Ribes" is of disputed meaning: one version states that "Ribes" comes from the Danish "ribs" a name for red currants. 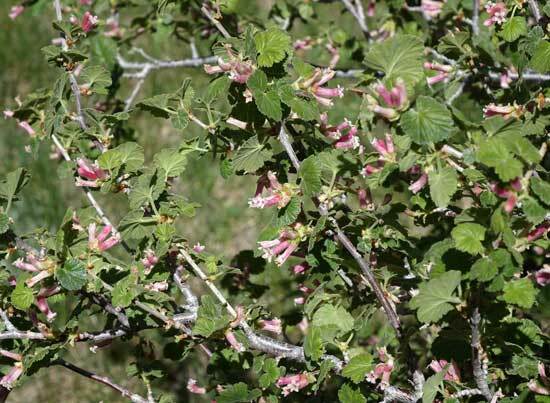 Another version is that "Ribes" is from the Arabic name for similar plants. We do know that Linnaeus named this genus in 1753. To red flowering Ribes. To yellow flowering Ribes..
Foothills, montane, subalpine. Woodlands, canyons, rocky areas. Spring. 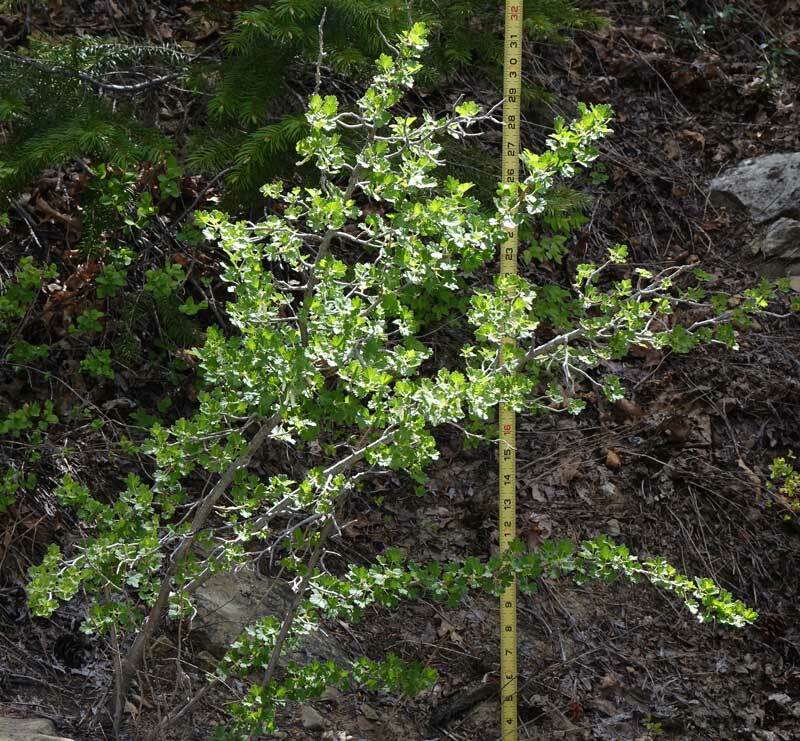 West Mancos Trail, June 26, 2004 and Upper Robertson Pasture Trail, Abajo Mountains, Utah, June 2, 2006 and June 25, 2010, and Lower Robertson Pasture Trail, May 31, 2016. 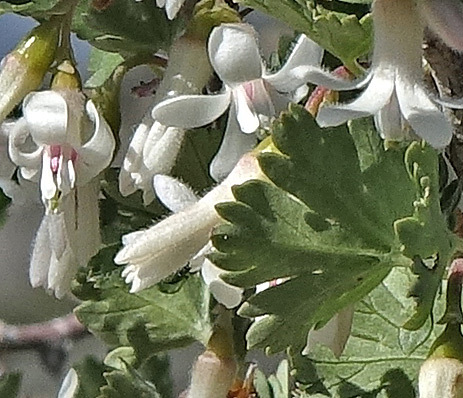 Ribes cereum is many-branched and grows to six feet tall on dry sites. 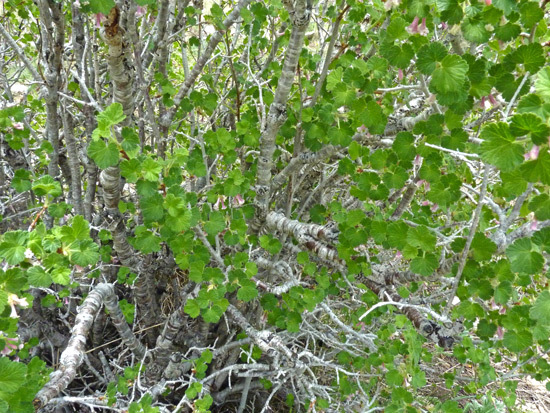 Stems are gray and woody without spines or prickles. Flowers are numerous and white, pink, or light yellow. Leaves are small, rough (from numerous, short, stiff hairs), shallowly lobed, and have a pleasant spicy aroma. "Cereum" means "waxy" and refers to the waxy secretion of the leaves. "Inebrians" is Latin for "drunk" and refers to intoxicating qualities of the fermented fruit. 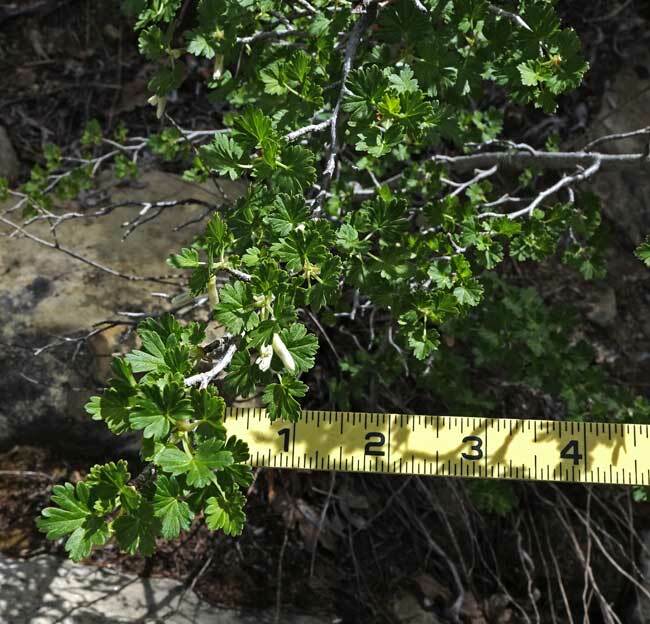 West Mancos Trail, June 26, 2004 and Upper Robertson Pasture Trail, Abajo Mountains, Utah, June 2, 2006 and Upper Robertson Pasture Trail, May 31, 2016. Flower color is white according to Weber and Intermountain Flora and pink-to-white according to Guennel and Welsh. Notice the glandular hairs on the flowers and the wonderful shape of the protruding, green styles (both characteristics are especially noticeable on the pink flowers). The leaf surface is also quite glandular as a visual observation makes plain but a squeeze of the leaf is an even better indicator of how glandular and sweet smelling the leaves are. Knoll near Robertson Pasture Trail, Abajo Mountains, Utah, August 16, 2011. 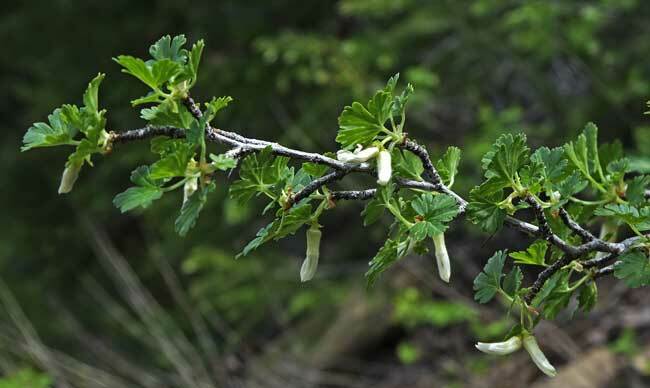 Ribes cereum's smooth berries are soft and juicy, with a mild, but unusual, fruity taste, due in great part to the same chemicals that give the leaf and flower its glandular smells. Semi-desert, foothills, montane, subalpine. 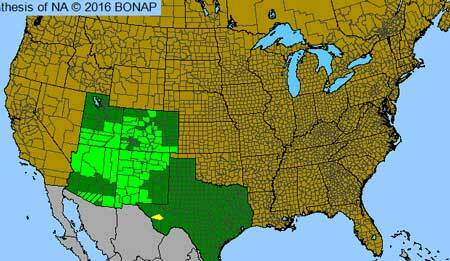 Woodlands, streamsides, moist areas. Spring. Hawkins Preserve, Cortez, April 14, 2015. 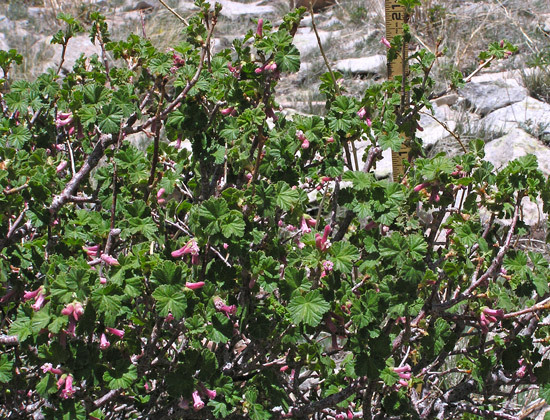 Ribes inerme shrubs, as shown at top left, are commonly 5 feet high and wide but can stretch to 8 feet. 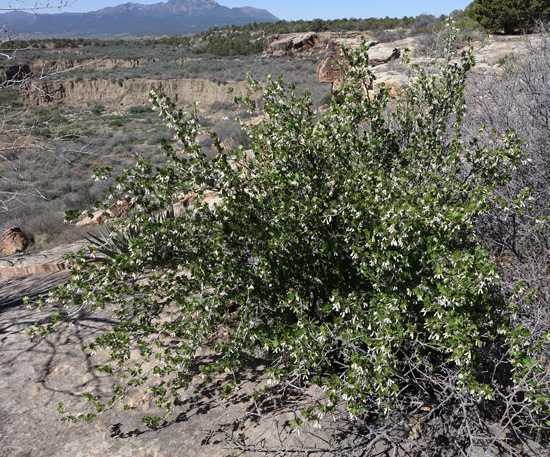 Although Ribes inerme prefers montane moist areas, it can be found (as shown at left) on rim rock at 6,200 feet because of the abundant moisture available from water run-off. 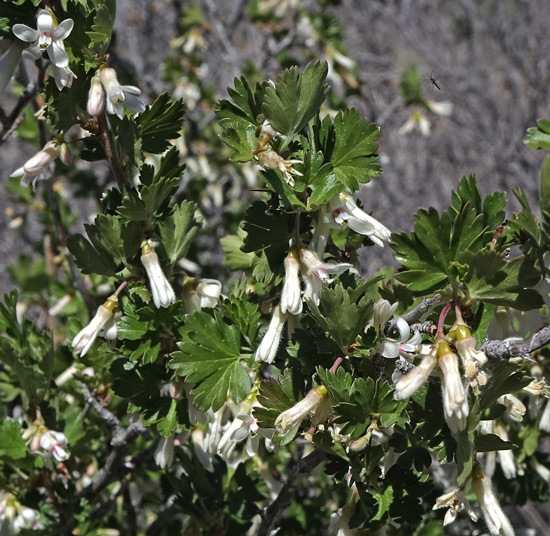 Ribes inerme was first collected in Yellowstone National Park in 1885 by F. Tweedy and was named by Per Axel Rydberg in 1900. "Inerme" means "unarmed", i.e., not having spines, but in our area it is common to find spines on this shrub. Tiny, drooping, green/yellow to yellow/white to white flowers have an elongated tube (the hypanthium formed from a fusion of the calyx, corolla, and stamens), then flared back sepals (about 3 mm long), and then shorter petals (about 1.5 mm long). The three flowers at the top of the photograph have their sepals bent backward ("reflexed") but their shorter petals still have not reflexed. In all three of these you can see the tips of the stamens protruding a bit beyond the petal tips. 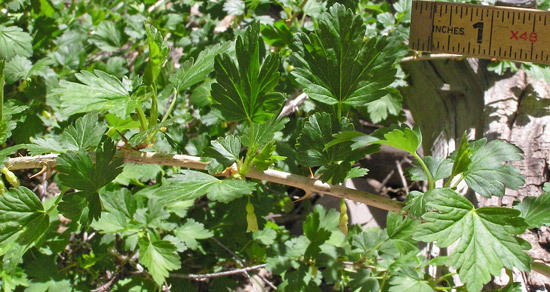 The latter characteristic is key in separating Ribes inerme from Ribes leptanthum (see below). Shearer Creek Trail, May 17, 2006. Flower petals are green when just opening and white when fully opened. Notice that the filaments (the stalks supporting the anthers) are quite long and project well beyond the petals. Leaves are smooth and deeply lobed into almost three equal divisions. Straight, to slightly curved spines are commonly present. They can be seen near the center of the photograph along the main, flesh-colored, horizontal stem and in the bottom right corner of the above photograph. The smooth berries (not shown) vary from red to green/purple or black. Semi-desert, foothills, montane, sub-alpine. Woodlands, shrublands. Spring. Knife Edge Trail, Mesa Verde National Park, May 16, 2017. 1) The stamens of R. leptanthum do not protrude beyond the petals; the stamens of R. inerme do protrude beyond the petals. 2) R. leptanthum grows from 1.5 to 6 feet tall; R. inerme grows from 2.5 to 7 feet tall. 3) Leaf blades of R. leptanthum can be a bit more than 2/3 inch in diameter; leaf blades of R. inerme are 2/3 to over 3 inches in diameter. 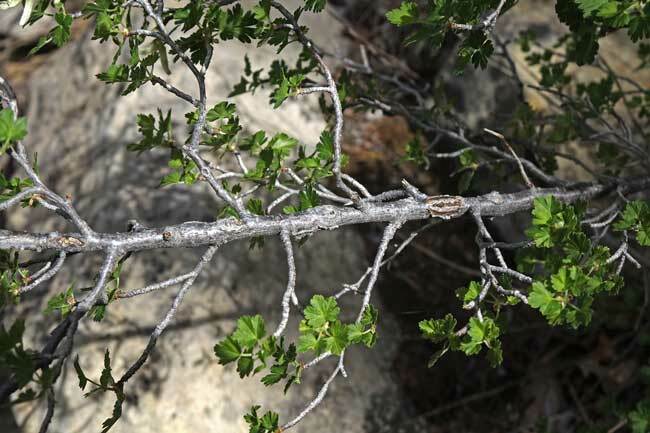 As the second to last photograph at right indicate, new growth is often a light orange and has thorns. Older growth, as illustrated by the last photograph, becomes gray and thornless. Augustus Fendler collected this species for science in 1847 in the Santa Fe area, and Asa Gray named and described the plant in 1849.